According to Frost & Sullivan, global logistics spending is expected to grow from $7.9 trillion in 2017 to $16.9 trillion USD in 2025, with transportation accounting for a majority of the spending at about 70 percent, or $11.8 trillion USD. There is a huge opportunity for firms that can successfully automate and disrupt this market. The new study summarizes opportunities and challenges in the global freight brokerage space, where automation is needed but many new entrants are having a hard time getting market penetration and revenue. Frost & Sullivan estimates that despite massive investment in the digital freight space, with more than $2.3 billion invested globally in 2018 alone, only 0.2 percent of $715 billion per year of these transactions were made via automated platforms in 2017. Despite rapidly growing uptake of technology by freight shippers and transport companies alike, Frost & Sullivan predicts that by 2025, freight digitization will be taking off, with 3.7 percent of the then $944 billion per year market running through “automated on-demand” systems like Freightera, which they project will then have aggregate revenue of $35 billion per year. Frost & Sullivan organizes the global "Key Solutions" in a summary graph, placing Freightera among the top firms globally in automation and growth potential to 2025. 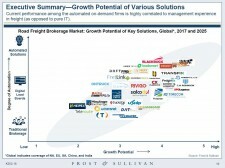 Frost & Sullivan highlights Freightera's difference: "It is a unique digital marketplace that aggregates long-tail carrier rates, availability, and low-emission options for business freight shippers." Despite the steadily increasing annual investment in freight digitization, reaching $2.3 billion USD in 2018, an even larger investment ($9.5 billion) has been in the acquisition of key companies in the space and this consolidation is expected to accelerate as the market matures. The exception may be North America, where Frost & Sullivan predicts that it will be shared by several leading solutions. 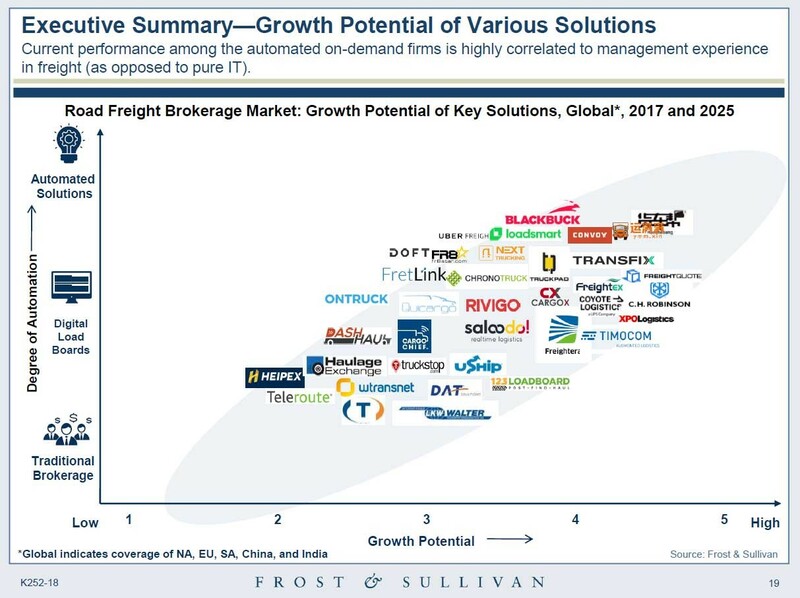 Frost & Sullivan identifies the “key automated on-demand brokerage solution providers in North America” likely to share this space as Convoy, Loadsmart, Transfix, NEXT trucking and Freightera. Freightera is creating a unified global marketplace for freight shipping. Starting in North America, Freightera is automating freight transportation and increasing operating margins for carriers and businesses shipping freight. Freightera creates partnerships and systems and promotes new technologies that allow businesses to find the best price and lowest-emission transportation options. Over 9,000 manufacturers, distributors, wholesalers and retailers in the U.S. and Canada use Freightera for 24/7 online access to billions of all-inclusive freight rates and instant freight booking. For more information, see freightera.com. Frost & Sullivan is a business consulting firm involved in market research and analysis, growth strategy consulting and corporate training across multiple industries. It is headquartered in Mountain View, California, and has offices in over 40 countries. With Venture Capitalist Funding Stoking Digital Brokerage Solutions That Improve Trucking Efficiency by Minimizing Empty Miles, Truck Brokerage Digitization to Grow at CAGR 33.6% Between 2017–2025. See full report at http://www.frost.com/sublib/display-report.do?id=K252-01-00-00-00.